After 14 months of learning and training the basic skills of BikeTrials, I have decided to test myself on a home-made section. The design of the section had to be within my current skill level. 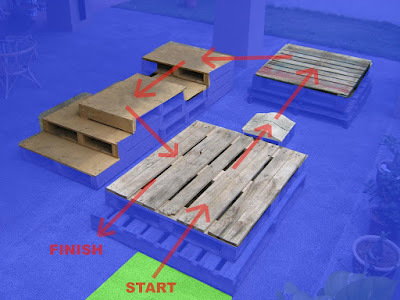 I remembered a friend from Singapore telling me that, you only need to master 3 basic BikeTrial skills to be able to compete. And they are track-stand, hopping and pivoting. And so I set out to collect wooden pallets and concrete blocks as materials to create an obstacle course for the section that I personally think would be ridable using only the 3 basic skills of track-stand, hopping and pivoting. From the following photo, you can see the results of my hard work... LOL. 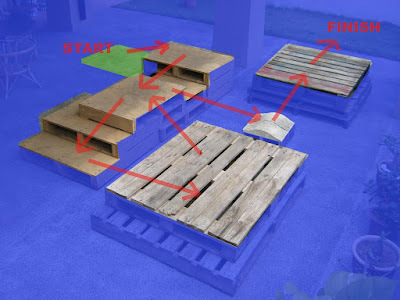 A BikeTrial section that can have many Start and Finsh points, depending on how creative you get.... HAhaha. When I started to layout the section, I wanted to ensure that it is doable with those three basic skills. But then again, depending on where I set the Neutral, Start and Finish zone on the above same layout, I can make the section tougher or easier. The Start and Finish points of this section was to ensure that I can use the 3 skills of track-stand, pivoting and hopping to clear it. My objective was to clear the section with out any dabs! Yes, zero dabs! "Clean" the section as they say. When I first setup the section and looked at the ride directions, the first thing that crossed my mind was that it was a piece of cake to ride! Hahahaha... EASIER SAID than DONE!!!! Let me put it as gracefully as possible... I fumbled, fived, blistered, stumbled and almost passed out from loss of stamina. This photo illustrate where I start and finish. The arrows indicate the directions, where I would be riding. This is the same photo of the above, but with the "no-ride zone" marked out in Blue and the Neutral "start zone" marked out in Green. If any of my wheels touch the Blue zone, it would be considered a automatic 5... that means you are out! After trying and trying and trying... I could managed to finish the section in 1 or 2 or 3 or 4 dabs... NEVER zero dab! It was getting more and more frustrating. So last night, I decided to use my 26" (I was using the 20" all this while) to try ride the section. I did it a couple of times, again missing the elusive zero dab! I was going to give up for the night when I decided to give it one final try and switched to using my 20" Monty. To my amazement, handling the 20" was smooth and easy (I think after using the 26", moving to the 20", made it easier to balance and ride) I managed to ALMOST reach the Finish line with ZERO dab... WHEN my son came out and called, "Daddy, Mommy calling you!" Needless to say, I was startled and ENDO-ed at the finished line crashing into the flower pots!!! LOL... I could not believe it! I almost did it! The front wheel hub almost crossed over the imaginary finish line with zero dab! I was stoked! The fire was burning HOT! After that I managed to zero-ed the section 3 more times!!! And just so I could sleep better, I did it a fourth time!!! LOL... I was very tired and my arm muscles were aching... but who cares I cleared it! I am now contemplating the following ride directions. It would be very much more challenging than the previous configuration. 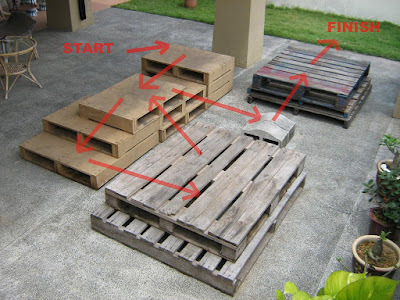 I think here, I would be required to pedal kick off the platform onto the concrete block, precision pedal kick is still a skill I am totally not comfortable with yet. Different Start and Finish points, changes the skills level required to ride this section. This is the same photo of the above, but with the "no-ride zone" marked out in Blue and the Neutral "start zone" marked out in Green. As of now, I have no confidence in finishing this section with zero dab. I think I can clear it with 2 dabs. HAhaha... lets see how it goes. Most likely, I will continue to ride the previous section until I can really ride it at zero dab consistently. Man... I Sucked In Dirt Jumping!